• How Did Mooch Make His Money? The failure of the Republicans, who now control the entire government, to fulfill their 7-year-old promise to repeal the ACA may come back to bite them in next year's midterms. Tim Phillips, president of the Koch brothers' Americans for Prosperity, put it like this: "This is an epic failure by congressional Republicans." Republican strategists now agree that the pressure to pass tax reform in September will be immense. If that fails (see below), the feeling is that there will be hell to pay next year. The Republicans' current woes are overlaid over the historical background of midterms almost always being a referendum on the president. Nearly all the time, the president's party gets whacked because his supporters are disappointed that the president didn't accomplish all the things he promised. If Donald Trump fails on repealing the ACA, fails on tax reform, doesn't build a wall on the Mexican border, and can't pass an infrastructure plan, it could be bloody. Here are the past 20 midterms, to give some historical background. 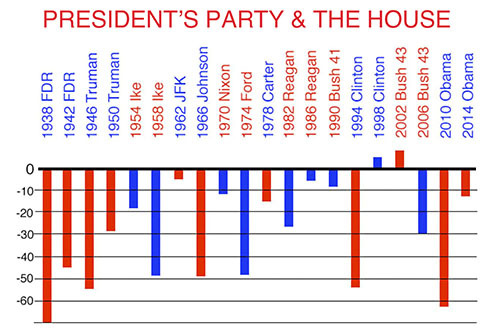 The bars show how many seats the president's party lost in the House. The president's party nearly always get hit hard in the Senate as well, but next year the Republicans have such a favorable map, with only eight Republicans up for reelection, six of whom are in deep red states like Wyoming and Mississippi, that they will probably escape without losing many seats, and they might even gain a few. The problem facing the GOP is that party activists and professionals are fuming at having blown a golden opportunity to fulfill a long-standing promise, while ordinary voters are going to wonder if Republican promises mean anything at all. Some of the conservative activists are looking for ways to punish Republicans who dragged their feet all year on repeal, even if they voted for the final bill. One of their targets is Sen. Dean Heller (R-NV), who is the weakest Republican senator up in 2018. If he is primaried, that simply increases the chances that the Democrats pick up the seat. Sens. Lisa Murkowski (R-AK) and Susan Collins (R-ME) can't be primaried next year because they are not up until 2022 and 2020, respectively. However, Collins may run for governor of Maine in 2018, so conservatives could primary her just to punish her, even though that would increase the chances of getting a Democratic governor in the Pine Tree state. The federal tax code is a mess. There are special breaks for home owners, ministers, veterans, blind people, gamblers, sick people, shipwreck survivors, bike riders, K-12 teachers, job seekers, Native American whaling boat captains, astronauts' widows, breast pump owners, and a lot more. One list of the tax breaks for various special interests runs 1,100 pages. If the Republicans want to make permanent changes to the tax code using the budget reconciliation process, the changes have to revenue neutral over 10 years, so they are going to have to axe many of these, especially since the border adjustment tax is now officially dead. The problem, of course, is that most people don't care about say, special deals for whaling ship captains, but they care very much about a few that affect them and will go to the mat to defend them. To make it worse, many of the tax breaks are regional in nature. One big one is the deduction for state taxes. This hits hard in high-tax blue states. Heaven help the 9 New York or 14 California Republican representatives if they vote to eliminate the deduction for state and local taxes. Tax breaks like this pit state against state, rather than Democrat against Republican. There are a lot of gangs in America, from the Crips and the Mexican Mafia to the Vagos Motorcycle Club and the Trinitarios. However, there is one gang that has become an obsession for Donald Trump: Mara Salvatrucha, aka MS-13. He talks about them constantly, and tweets about them regularly. In fact, he's tweeted more about MS-13 as president than he has about the AHCA, Michael Flynn, Medicare, Robert Mueller, or ISIS. On Friday, Trump continued on the MS-13 theme, delivering a speech about the gang to supporters and to members of the law enforcement community in Long Island, New York. And as part of that address, he enthusiastically endorsed police brutality, and declared that, "When you see these thugs thrown into the back of a paddy wagon. You see them thrown in, rough. I said, 'Please don't be too nice.'" The police in attendance appeared to find the remarks delightful. Those who were not in attendance, not so much. Across the nation, police departments responded to the President's remarks with disappointment and/or anger. For example, officials with the Suffolk County PD, responsible for law enforcement in the area where Trump was speaking, issued a statement that reads, "The Suffolk County Police Department has strict rules and procedures relating to the handling of prisoners, and violations of those rules and procedures are treated extremely seriously." The Boston, Los Angeles, New York, and Chicago police departments, among many others, issued similar statements. Speaking of Donald Trump's downward spiral, Saturday was his first full day free of interference from former RNC staffers (aka grownups). And the early returns suggest that he's delighted to be free of Reince Priebus's shackles, because Trump fired off a shotgun blast of a tweetstorm yesterday. Michael Flynn was forced to resign. Robert Harward didn't want the job. That makes current NSA Herbert McMaster the third person to be chosen for his job in just over six months. The tally may soon reach four (or more), as McMaster is now regretting that he ever accepted the appointment. Gov. Brian Sandoval (R-NV) may be the downfall of Sen. Dean Heller (R-NV) next year. Not that he wants to be, but he may be anyway, against his will. Sandoval was strongly against all of the Republicans' health-care bills and there is plenty of footage in which he strongly expresses this. Heller voted for the final bill. The attack ads write themselves, with clips of Sandoval urging the Senate not to pass the bills because they would be bad for the people of Nevada, followed by clips of Heller saying he will vote for them (or clips of him actually doing so). In fact, the ads against Heller have already started. Making Heller's life even tougher is that the Democrats have already settled on a candidate, Rep. Jacky Rosen (D-NV), who represents the Las Vegas suburb of Henderson. After the final health-care vote, she said about Heller: "No politician from our state has ever been more dishonest about their intentions, more misleading about their position or more disingenuous to their constituents." And this is only the start. It's going to get much nastier. Rosen, as a House member, has the added advantage of having actually voted on one of the bills (the AHCA) and she voted "no," like all the other House Democrats. Expect: "I voted to save your health care and he voted to kill it" to be a big campaign theme for her. How Did Mooch Make His Money? It is no secret that Donald Trump has no respect for anyone unless he is either rich or a high-ranking military officer. Much of his interest in his new communications director, Anthony "Mooch" Scaramucci, is due to the fact that he is rich. This raises the interesting question of how Mooch made his money. Treasury Secretary Steve Mnuchin made his fortune in investment banking, Hollywood films, and subprime mortgages. Commerce Secretary Wilbur Ross bought up distressed companies and squeezed them. Education Secretary Betsy DeVos got her billions the old fashioned way: She married a man who inherited a fortune from his father. What about Mooch? Mooch made his money in an unusual way. Hedge funds invest in a wide variety of assets and use many financial techniques to try to make money when their assets go up but also when their assets go down (e.g., selling short)—that is, by hedging their bets. The problem with hedge funds from the point of view of an investor is that they won't take you as a customer unless you are very, very rich. So what's a person with only, say, $1 million to invest to do? That's the problem Mooch solved. He created a company that invested in hedge funds but he didn't reject clients who were merely garden-variety rich. By investing in his company, Skybridge, a merely rich investor could get some of the hedge fund action despite the fact that the actual hedge funds would look down their noses at him if they showed up. Skybridge was reasonably successful with this strategy, and Mooch reportedly sold his share in the company for $100 million. Jul29 Can a Pardon Be Questioned?